The fire is now out, officials said. 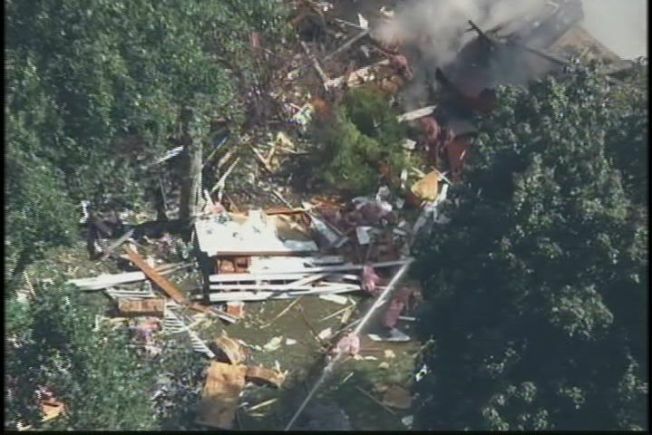 Investigators are exploring whether a gas leak is to blame for the Tuesday explosion that destroyed a sprawling, 6,000-square-foot Connecticut home valued at $1.1 million. The explosion and fire at the Stamford residence, described by one official as a “scene out of hell,” shook the Webbs Hill Road neighborhood at around 2 p.m. on Tuesday, bringing in firefighters from Greenwich and New Canaan to assist Stamford firefighters, according to the mayor's office. City officials said during a news conference held a couple hours after the explosion that a 500-gallon underground propane tank was burning and firefighters could not put it out. This morning, local officials said the fire was extinguished just after midnight. "They sent a machine up there to start probing to see if there were any clues for another theory, but it look very strongly that it was a gas explosion," Stamford Mayor Michael Pavia said. The road to the home was still blocked off Wednesday morning as officials continued to dig through the debris and a portion of the property is still burning as part of a controlled burn. No injuries were initially reported, but the homeowner, Guiseppe Cardillo, was out by the pool house when the explosion happened and was taken to the hospital as a precaution, city officials said. He was alert when he was transported from the scene and has since been released. A firefighter was also later taken to the hospital to be treated for a minor injury, fire officials said. Pavia said it a miracle no one was seriously injured or worse. "It's amazing, if you look at photos of the house and the crater that's left there now it's just incredible," he said. The explosion destroyed the house and helicopter footage from WNBC showed a massive amount of smoke billowing over the remains of the demolished house soon after it happened. Neighbors who were home at the time of the explosion said they had no idea what was happening. "All of the sudden, there was a massive explosion and the whole house shook right down to the foundation," said Peter Gow, who lives just a few yards away. Gow was the first at the scene and rushed to call 911 after seeing the demolished home. "I ran through the woods towards where the alarm was, thinking maybe someone's boiler had exploded and came across something much worse," Gow said. There was only one fire, despite some earlier reports, but the blast propelled material from the house to nearby properties and one other nearby house was slightly damaged. "We were able to get our chief building inspector up there right away, who evaluated the other homes for structural integrity and found them to be safe to live in," Pavia said. Officials said it could be days before they know for sure what caused the explosion. This is the assessor's record photo of the house.